GAMEZY - The newest fantasy cricket platform where everybody’s a winner! Gamezy, a new fantasy cricket platform is all set to be launched by Gameskraft, a leading online game development company in Bangalore. The soon-to-be launched platform aims to make fantasy gaming even more experiential, with a promise of ‘more rewards and more fun’! Gamezy is different from all other existing fantasy cricket apps as it breaks through the traditional fantasy gaming experience with a focus on ensuring more players win. Currently, players can partake in many pre-launch contests which will help them earn wallet cash. 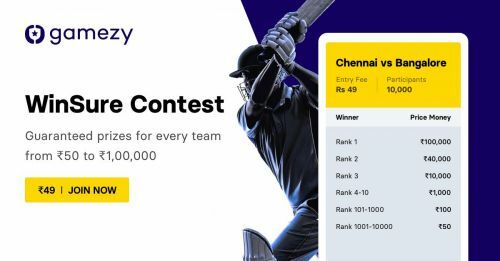 One such activity is the Winsure contest, where every user will get guaranteed cash prize while the 1st prize winner can walk away with ₹1 lakh. The contest starts right now and has entry limited to first 10,000 players. Participants can join the contest now and can create the team later. They can create their team till the CSK vs RCB match starts on 23rd March 2019. Players also get joining bonus of ₹100. Players can take part in cricket quiz and answer a few questions or write blogs on given topics to earn cash prizes. Apart from earning and winning wallet cash, players can also win many rewards along their journey as they take part in different Pre-Launch contests on Gamezy. The rewards range across a spectrum of brands and includes discounts and offers for shopping from these brands. These pre-launch activities are aimed to ensure that players win big and get a head start to play fantasy cricket once the T20 season kicks off. Gamezy will make its debut with this IPL season. With so many rewards to be won even before the season starts, it will be an opportunity for the cricket and T20 enthusiasts to witness and experience fantasy cricket in an all-new experiential avatar. From virtually being team owners by creating their own teams, to taking informed decisions to win more, it will be a new fantasy gaming experience. Log on to www.Gamezy.com for more details. Gamezy is the latest offering from Gameskraft - India’s fastest growing gaming platform. Gamezy aims to be the most rewarding fantasy game providing more rewards for gamers interested in winnings. The fantasy game will debut during this year’s T20 Cricket season with a vision to create a delightful and seamless experience, ensuring more variety for gamers looking for participation and engagement during the matches. Is IPL a boon or a bane for Indian cricket?